This second issue of GEAR explores the hometown of the four incompetent cats. The cat town’s giant robot guardian is attacked by a gargantuan mechanical insect. The whole town is thrown into a panic as they wait for the heroic return of the bumbling cats sent to bring back a Giant Killer Robot protecter. In this issue we promise a bird shot through the heart, 2 giant robot fights, and Simon’s twisted account of heaven. GEAR is still brilliantly written and drawn by Douglas TenNapel. TenNapel is the creator of Earthworm Jim and the quirky clay animated computer game The Neverhood. He is also responsible for writing and illustrating issue 3 of SCUD: TALES FROM THE VENDING MACHINE. Doug also helped Rob move which included moving a heavy dresser up a flight of stairs in the August heat. 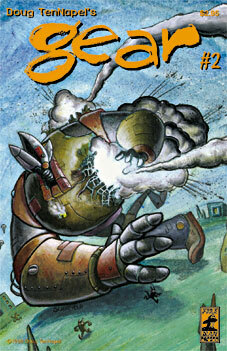 GEAR is an action-packed, goof-fest featuring TenNapel’s usual convaluted plot twists and funny drawings. Brought to you by Fireman Press Ltd and labeled as "neat" by Rob Schrab.